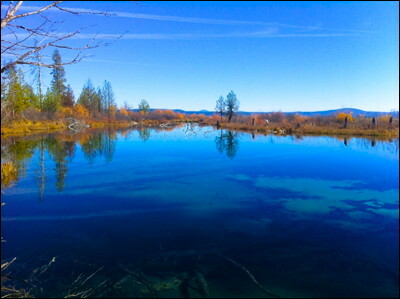 Images from Mare's Egg Spring near Upper Klamath Lake in southern Oregon. Mare's Eggs (Nostoc pruniforme) are rare algae-like organisms. Cold water algae produces colonies of round balls whose survival depends on constant water temperatures of 39º to 43º F, and sufficient water depth to provide the thermal layer that protects the eggs from changes in water temperature.